We’ll have many different varieties of perennials available. 1 gallon pots are $10.50 each. If you’re driving by and see the OPEN flag please come on in! Made on the farm from fruits grown in New York State. 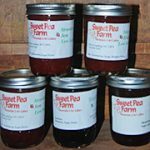 Three varieties always available; Strawberry, Strawberry Rhubarb and Blueberry. Other seasonal varieties, please call for availability.